Many people seem confused about the teaser trailer for the next James Bond flick, SPECTRE. I'll explain everything they previewed and show you all the usual stuff you expected, but that they kept out of the trailer. First, some background to explain what we got in the trailer. In Skyfall (2012), we saw the old M. (Judi Dench) perish at the hands of Silva, following the destruction of the famous SIS / MI6 headquarters in London and Bond's ancestral home, called Skyfall, in Glencoe, Scotland. Que the new MI6 crew with M. (Ralph Fiennes), Moneypenny (Naomi Harris), and well.. Q (Ben Whishaw). The trailer begins with Moneypenny handing Bond his leftover belongings from the Skyfall explosion (after a thorough investigation by MI6) and questions him on what they found. There's a guardianship form and a photo with a young James, a man, and another mysterious youngster unidentifiable due to damage. "You've got a secret. Something you can't tell anyone, because you don't trust anyone." Ya, he's a secret agent, lady - literally an agent of secrets. You being a former agent and the boss's secretary should understand that concept. I can't help but think that MI6 must have already looked into this before making him a Double-O. The trailer moves on to show Bond in the Austrian Alps, heading for a mysterious cabin in the fog. I bet there's a bad guy in there - yep. That bad guy is Mr. White (played by Jesper Christensen) who previously featured in Casino Royale (2006) and Quantum Of Solace (2008) working for the Quantum organization, hence the "familiar face" line. I do not know how the evil Quantum organization plays into the evil S.P.E.C.T.R.E. organization, but all of the S.P.E.C.T.R.E. guys get some form of the cool octopus ring. There are the typical movie analogies, like the crows that fly at Bond - an easy metaphor for death - and the more subtle nods like the S.P.E.C.T.R.E. octopus ring being slid across a chess table. This is referencing the 1963 film From Russia With Love, which begins with a S.P.E.C.T.R.E. bad guy playing a chess match. That film didn't introduce the shady organization - the previous film Dr. No (1962) did - but it fully developed them as a world-reaching group. Some would say a Special Executive for Counter-intelligence, Terrorism, Revenge and Extortion. "You are a kite dancing in a hurricane Mr. Bond." At seven o'clock precisely the twenty men who made up this organization strode, lounged or sidled, into the workmanlike boardroom on the third floor. Their chairman was already in his seat. No greetings were exchanged. They were ruled by the chairman to be a waste of breath and, in an organization of this nature, hypocritical. The men filed round the table and took their places at their numbers, the numbers from one to twenty-one that were their only names and that, as a small security precaution, advanced round the rota by two digits at midnight on the first of every month. There is an entire chapter dedicated to describing the organization and their meetings, but you get a pretty good idea from that. At the head of the table sits No. 2, a.k.a. Blofeld, who is described to be treated by the other members as "god-like" in relationship. In the book they plan out a way to steal a nuclear warhead and hold the West at ransom. It is not clear if the guy in the trailer and movie will in fact be Blofeld. "It has been a long time, and finally, here we are." About the brothers. It is pretty safe to assume that the dialogue at the end isn't actually part of what we're seeing in the trailer. Bond has probably just slipped into their meeting, and what we are hearing comes from a later conversation between the snooping spy and the shadowy guy (Christoph Waltz). A lot of what I am reading in the comments of the trailer's YouTube page and around Kinja suggest that people think this will be Bond's long-lost brother. That is not the case.. exactly. The guardianship paper scene in the trailer reveals that Bond's guardians (after the death of his parents at age 12) are Chairman Bond, James Bond's paternal Aunt from the novels, and Hans Oberhauser - who was an older ski instructor in the original novels. Christoph Waltz's character in the script is named Franz Oberhauser. Wait, does James Bond have a step-brother? I guess we will just have to wait and see. The trailer ends with the glass octopus resembling the S.P.E.C.T.R.E. logo-emblem-ring design. The bullet through the glass references a scene in the film, but it may also be a slight nod to the sad ending of 1969's On Her Majesty's Secret Service, in which the head of the evil organization shoots Bond's wife through the windshield of a car. I'll save you the photo. Talk about dark. Many fans - and the general public - seem surprised at the lack of action packed Bondian stuff in this teaser. Come on! It's a teaser! I think it did its job if so many people are asking questions. Who is asking about Mission Impossible: Rogue Nation? Exactly.. they have already previewed everything. I am really liking the inclusion and (apparent) slight re-working of Ian Fleming's original text. That worked out very well for Daniel Craig's first Bond movie, Casino Royale. Have no fear though, SPECTRE will not be all substance as there is quite a lot of work - and budget - going into the "surface" action stuff too. I'll go in the order it should appear in the film, kind of like a trailer. This will be the pre-titles-sequence which famously opens just about every Bond film. It's the part before the dancing naked ladies and music. Bond is in Mexico, chasing some dude through the Day Of The Dead festival. A helicopter shows up - piloted in real life by insane aviator Chuck Aaron, who is famous for doing crazy helicopter stunts for Red Bull. Anyways, to avoid spoilers I'll just say Bond spoils their plot and Aaron does his crazy-helicopter thing, and this leads Bond to Rome, Italy. That lady in the trailer is at a funeral for a reason. Collider has a complete breakdown of the film-opening. Follow my Instagram for more content here. Que the Aston Martin DB10. Also, Rome is where the S.P.E.C.T.R.E. meeting takes place (even though it was filmed in the UK). There is a chase with the Jaguar CX-75 through the city that ends along the banks of the Tiber River. Yes, that is a Bugatti EB-110. It is probably driven by an insane megalomaniac at that meeting, though. I covered the Rome sequences extensively here and here. This is where Bond meets Mr. White in the trailer. Earlier in the year, the Bond team filmed a huge action set piece on the side of the Alps between Bond in a small plane and the bad guys in a grouping of Land Rovers. The double-barreled pistol lets us know he is bad. You can read about that awesome truck over on BeyondJamesBond. I went into detail about the scenes they filmed here. The rest of the film takes place in London and somewhere in Morocco, where there are two more action set-ups yet to be filmed. 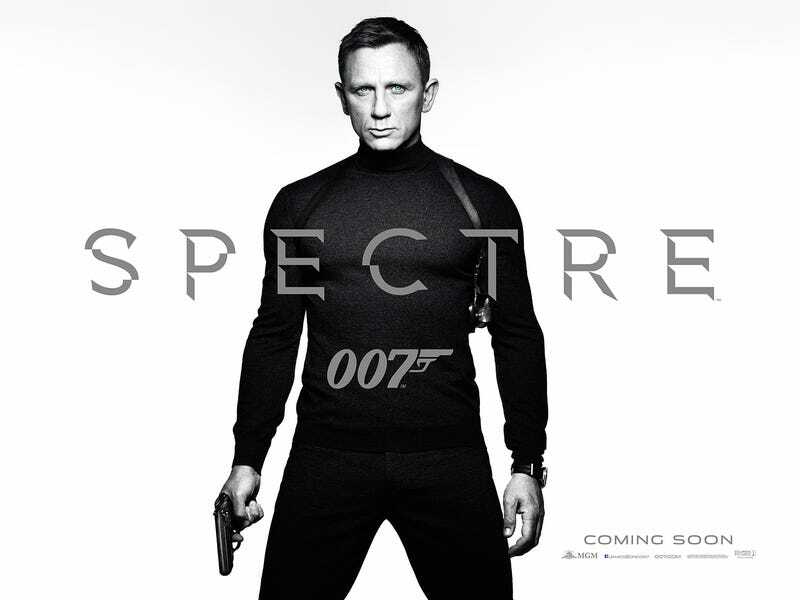 Having just recently released the teaser poster, we can expect our next look at SPECTRE to be a full poster sometime in the next couple of months. After that is one or two more trailers, and then the film will release in North America November 6th in IMAX. Photo's sourced from Getty, Collider, 007.com, or have been re-used from previous postings linked throughout the article. Some photos may come from social media sites for public use. For more information on James Bond and beyond, check out and/or follow my Kinja blog BeyondJamesBond. For more photo and video content, I post daily to the BeyondJamesBond Instagram account so give it a follow. Now I'm going to go back and watch the trailer again. And again.